Had I played Beneath A Steel Sky: Remastered before Revolution Software’s other recent iPhone release of Broken Sword, I probably would have been utterly astounded at this upgraded point-and-click adventure game. 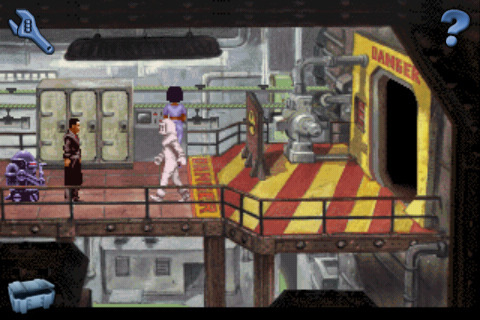 With the same innovative interface and sleek visual upgrade from famed Watchmen artist, Dave Gibbons, as Broken Sword, Beneath A Steel Sky is a marvelously subtle and polished port. While not aging quite as gracefully as Broken Sword, Beneath A Steel Sky’s recent facelift has definitely breathed new life into this 16-year old game. Set in a dystopian future version of Australia, you play as Robert Foster, a man who grew up far away from the fascist regimes of the City, in the heart of an aboriginal wilderness known as the Gap. When the authorities suddenly come for you, you quickly find yourself a fugitive, on the run in an unfamiliar and dangerous urban labyrinth, using only your wits and a deliciously snarky, robot pal named Joey to survive. If you’ve ever played a point-and-click adventure game before, you won’t be surprised that instead of frantically running and jumping your way to freedom, you take your time solving deviously complicated puzzles instead. Brainpower is rewarded far more than reflexes, and you’ll need an ample supply of smarts to get through the game. Thankfully for more casual players, there is a wonderfully gradual hint system in place to nudge you along. No walkthroughs required. Some purists or fans of the original may not like this new innovation, but the hint system is entirely optional, and this way you only have to bash your head against a puzzle for hours if you feel like it. Fans of the original, however, will definitely appreciate how much of the original feel of the game has been preserved. New cutscenes illustrated by Dave Gibbons definitely enhance rather than alter the original somber tones, although the graphics themselves have not changed, unfortunately. The dark humor of the writing is also still present, complete with full voice work. In general, the music and sound production values of the game are very high and to be savored. The touch screen interface works beautifully. Frustrated hunting has been eliminated by displaying all of the hot spots with a simple swipe, and moving and combining things in your inventory is as simple as holding your finger and dragging. Since the iPhone itself would have been a ridiculously futuristic device 16-years ago, some of the future looks a little, er, dated, but the general themes of urban corruption and totalitarian governance still feel all too relevant. Despite its age, this is a really solid and classic piece of adventure gaming, and if you enjoy well-written, deeply immersive games like Monkey Island or Broken Sword, you will almost certainly enjoy Beneath A Steel Sky. AppSafari review of Beneath A Steel Sky: Remastered was written by Tracy Yonemoto on April 25th, 2010 and categorized under Adventure, App Store, Fun, Games. Page viewed 4654 times, 1 so far today. Need help on using these apps? Please read the Help Page.